To reach the share of 20% of renewables in energy production set by the European Union, the number of non-deterministic power plants (mainly wind and solar power) has increased significantly . The traditional approach of the energy market, to satisfy an increased demand by increasing the production, will therefore no longer be feasible in the near future. One solution would be an increase in the storage capacities for electrical power to be able to utilise the energy generated at times where production exceeds demand. Unfortunately, the only overall effective storage available at the moment is the pumped storage power plant, which in turn has a large ecological impact. Another solution for the problem is demand-response (DR). Here the electricity consumers react on the current production and adjust their consumption accordingly. One of the most promising fields of application for DR is buildings and their heating, ventilation and air conditioning (HVAC) systems. On one hand, this is because their share of the overall energy consumption is approximately 40% in first world countries , on the other hand because a lot of electrical energy used by the HVAC system itself is converted into thermal energy, which is easier to store. This concept is not new, as e.g. the concept of off-peak storage heater shows, but technologies were created mostly for the traditional power plant portfolio, which has predictable patterns of overproduction. To be able to successfully integrate distributed energy resources, the concept of the smart grid is under development, combining information and communication technology (ICT) with energy grids, enabling more complex control strategies. As the pervasion of ICT also increases in buildings in the form of building management systems (BMS), this enables the building to be integrated into the energy system as an active participant – a grid friendly building. Is both increase and decrease in energy consumption possible? Is the schedule for the adjustments fixed or flexible? How long in advance the adjustments have to be requested? Is here is a guarantee for this behaviour? And if not, how likely is it that the building will act accordingly? Is the adjusted operation still efficient? And most important: Is the comfort of the occupant not compromised? insulation, and co-generation units which may allow the building to even produce electricity in times of need. While the technology for grid friendly buildings is mostly available, at the moment the proper incentives are missing. Those could either be financial benefits which would make them attractive to investors or legislation which would make the technology compulsory. Still the concepts for grid friendly buildings can already be used to increase the on-site use of generated energy, which already is quite cost efficient. 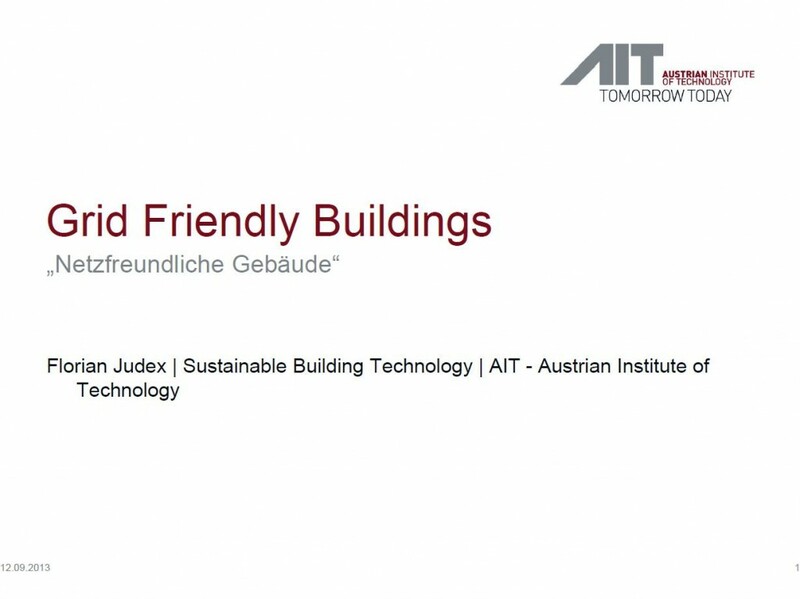 Therefore the additional components needed for grid friendliness can easily be considered when planning a new building or the retrofit of an existing one, adding a long term perspective to such projects. “EU energy and transport in figures”, European Commission, Luxembourg: Publications Office of the European Union ISBN 978-92-79-13815-7, 40ff. “DIRECTIVE 2010/31/EU OF THE EUROPEAN PARLIAMENT AND OF THE COUNCIL of 19 May 2010 on the energy performance of buildings (recast)”. Official Journal of the European Union; vol. 31, 2010.